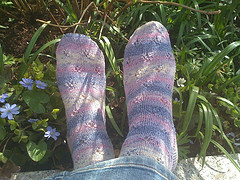 The first pair of socks I started way back in November or October, but other projects got in the way and so I only finished them a couple of weeks ago. For the ribbing I used about 3 cms of k1p1. The pattern itself is a rather simple eyelet pattern (with one eyelet on top, two eyelets on the left and right of the first in the following row and one eyelet beneath those two in the next row) with 8 rows of plain knitting inbetween… worked over 60 stitches, if I remember correctly. Anyway I just love the way it turned out. 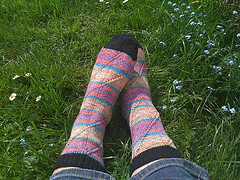 I also made up the pattern for my second pair of socks, which I call “Spiraling Eyelet Socks”. It’s a really simply pattern worked over 64 stitches. The ribbing is also k1p1 for about 3-4 cms. The pattern itself is just 4 evenly spaced eyelets in every other round, which are moved forward by one stitch. 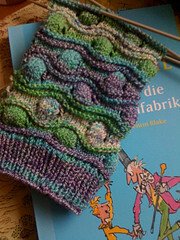 Right now I’m working on “Bubble Socks”, which so far look absolutely lovely but are a real pain to knit. 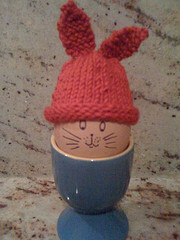 Btw the patter is of course from ravelry and can be found here!